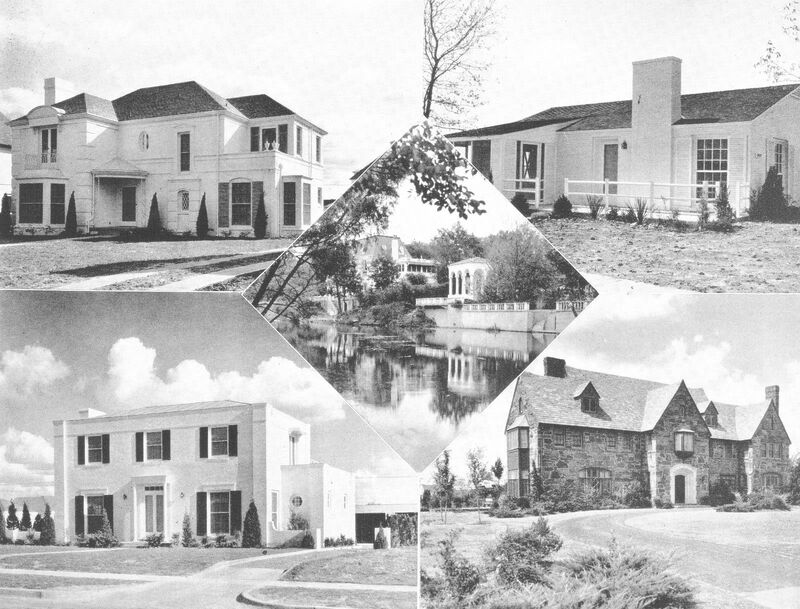 These photos are from a Chamber of Commerce-like booklet intended to lure new residents to the city. The photo montage above is from about 1943, and the one below is from about 1946. There are some beautiful houses here. In the photo above, I recognize Highland Park in the center and possibly lower right (the lower right has a lot of empty space behind it — maybe Bluff View or Preston Hollow?). The top right might be Oak Cliff? The house that makes me swoon is the white house at the lower left. It and the house above it look as if they might have been in Lakewood. If anyone knows the location of any of these houses — and if they’re still standing — please let me know! Visitors to Dallas invariably comment on its beautiful homes, both large and small, and the care with which they are kept modern and clean. The women of Dallas have their garden clubs, which are organizations of flower lovers. They vie with each other in striving to make their homes attractive to the passerby and homelike to those who live within. One reason for this is the high percentage of home ownership. A recent study indicates that 60 per cent of families living in one-family residences own their own home. This is far above the national average. For several years Dallas has been on a truly remarkable building boom in its residential sections. New homes are springing up at the rate of 14 a day and new subdivisions are being opened as rapidly as others are sold out. The outer fringe of Dallas is, in effect, a brand-new city. Lots that were cotton fields a few years ago now contain beautiful new homes and landscaped gardens. Any type of home plot is available to the prospective home builder here. If he desires a home in a close-in busy section, that can be found in many places. If he prefers a modest cottage on the outskirts, there are a dozen subdivisions where it can be found. If he is seeking a palatial residence or a rustic cottage on a country estate, he can find that too, and on short notice. Dallas takes much pride in its wide recognition as a city of homes. The beauty of Dallas may be attributed to the wide awake and broadminded citizens of some 25 years ago, who at that time, engaged nationally known landscape artists to design and plan the future Dallas. So well was this done and so cooperative were the people of Dallas that in this short time Dallas is known as one of the most beautiful cities in the nation. Dallas has attractive parks, driveways, public buildings and in fact hardly a house, no matter how humble, that is not improved with planting. As a city of homes the saying, “It is not a home until it is planted well” applies to Dallas. No tenant house is built today that is not surrounded by a setting of nature’s beauty. To the Garden Clubs and various women’s organizations much credit must be given for their untiring efforts to eliminate slum districts, unsightly streets and the planting of our highways. Much credit is due the nurserymen and landscape architects, who are ever ready to give advice, planting instructions, and who have furnished shrubs, flowers and assistance to many charitable institutions and public places, as well as make talks to the clubs and organizations on when, how and what to plant in order to constantly improve Dallas. The Garden and women’s clubs annually stage flower shows and have garden contests. All this has made Dallas today, a city beautiful – a place where you want to live. Photos are from the booklet So This Is Dallas, published by The Welcome Wagon. The top photo is from the circa-1943 edition, used with permission, courtesy of the Lone Star Library Annex Facebook page. The second photo is from the circa-1946 edition, from the author’s collection. Photos are larger when clicked. It’s unlikely the houses seen above were actually built in Dallas in 1943. During the war construction was essentially impossible, with the only significant exception being housing approved by the War Production Board for areas where housing for workers in war industries was critically short. Certainly the houses put up with WPB approval didn’t look like those shown here. Maybe this was a 1941 booklet? I used to live In Lincolnwood IL, just north of Chicago, and there are a number of houses there built in 1942, although completed in 1942 is more accurate. These had all been planned in 1940 and construction was allowed to finish on those on the drawing board. I lived in one for 30 years. Almost all were Georgian style. 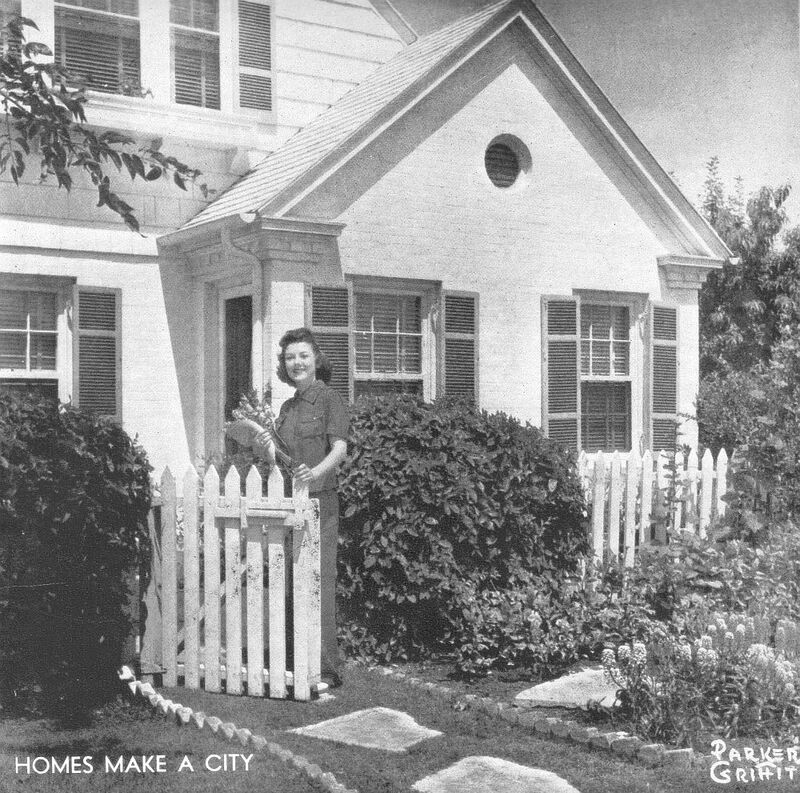 In May 1942 a proposed 50 “defense homes” were announced for the area (Bell & Howell was building their new headquarters down the street) as duplexes-which homeowners were assured would not be allowed when they bought their single family residences.. A handful were built before the homeowners went to court in July 1942 to stop construction and they were successful. The remaining houses built (a lot less than the projected 50) were all single family. Here’s a link to Google street view of Pratt Avenue-dulpexes to the left, single family to the right. Bell & Howell’s 11 acre complex was razed in the late 1980’s. This site has a postcard of the building down the page a bit. Sorry for the non-Dallas detour but I didn’t think you would mind.